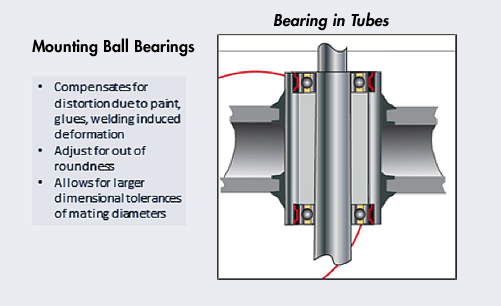 Tolerance rings can normally handle a ½ degree draft angle per side in a bearing housing. For this reason, they can often be used with zinc die-cast housings as well as glass-filled plastic housings, with no secondary machining operation. The rings also work well in aluminum housings in terms of handling thermal growth, but some machining is often recommended to clean up the draft. The graph above illustrates ring performance in retaining a 2.00” OD bearing in an aluminum housing. With .0012” traditional interference fit, an installation force of 500 pounds is required. Due to thermal growth between the steel bearing and aluminum housing, the bearing becomes loose at a temperature of 170 °F. With the Tolerance Ring, an initial installation force of only 320 pounds is required, and retention remains high at 230 pounds at 270 °F. Since draft angle on these brackets is minimal, they normally require no secondary machining operation. Oftentimes ANL or light duty AN-style rings are used to keep assembly forces low to avoid brinelling the bearing during assembly. Whereas glue and rubber boots trap heat, airflow around the rings may allow the bearing to run cooler. Elastomer boots can vary in their durometer readings (stiffness) and allow unwanted side movement of the bearing, while tolerance rings have a predictable spring rate to better center the bearing. The ring’s waves expand and contract to accommodate thermal expansion of the housing. Glass is needed as a hardener to prevent the ring from wallowing its way (creeping) into the housing. Typically, there is no need for an insert ring or any secondary machining operations. Tolerance Rings allow mounting precision bearings in stamped housings. 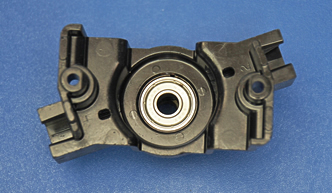 As the tooling wears and the housing bore decreases with later production runs, the waves deflect without taking up all the internal clearance of the bearing. 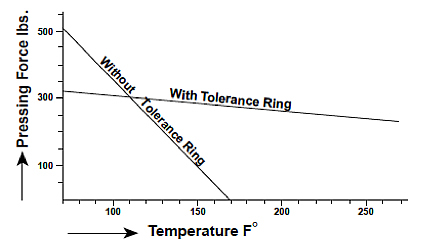 Tolerance rings compensate for tool wear with stampings. Power tools, which operate near energized wiring, often use molded bearings (outer race insulated with plastic) for electric shock prevention. Tolerance rings are ideal for dealing with both mechanical and thermal tolerance stack-up occurring with these molded bearings. Straight tubular sections, with a centered hole already bored, are natural housings for ball bearings. The tubes can be cut to the desired length and then welded to one another, forming a structural framework. Problems arise, however, due to tube bore tolerances not being acceptable for a bearing press fit. Other dimensional distortions occur from the heat produced during welding operations and the application of paint layers. What was previously a circular tube ID may now be out of round due to manufacturing processes. Tolerance rings can compensate for these incurred dimensional variations. An example is use of USA Tolerance Ring part number AN35X11S with a 6202 bearing inside a tube. Despite a 0.007” tolerance stack up in the final tube bore ID, the tolerance ring keeps the bearing fully functional. When bearings are pressed onto a shaft, low axial force tolerance rings can allow for easy alignment of the bearing ODs, minimizing the risks of cocking the bearings during assembly. The tolerance ring will also compensate for minor misalignments of bore /shaft centers. Fretting and corrosion constitute a detrimental wear process occurring at the contact area between materials under load and subject to minute relative motion by vibration or other forces. Tolerance Rings may reduce or eliminate this damaging wear process by shifting the vibrational frequency of the bearing away from the natural frequency of the system or by preventing rotation of the bearing outer race while allowing it to float axially. 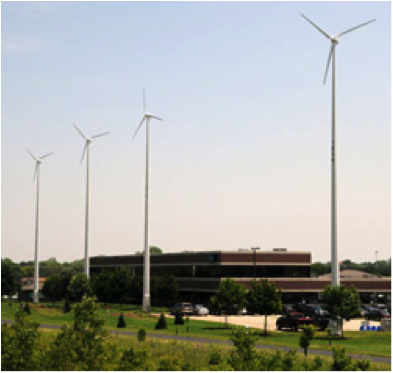 In one such application, 100mm OD preloaded bearings in the generators of electronically controlled wind turbines were encountering strong vibration. The bearings were prematurely failing due to fretting & corrosion. 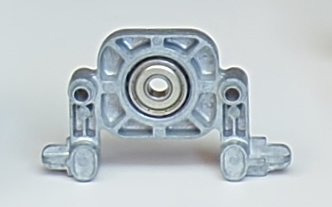 Upon mounting the bearings in the housing with Tolerance Rings, they no longer encountered fretting & corrosion and endured for their full design life-cycle. Tolerance rings can be used to reclaim worn housing bores or bores which have been accidentally machined oversized. 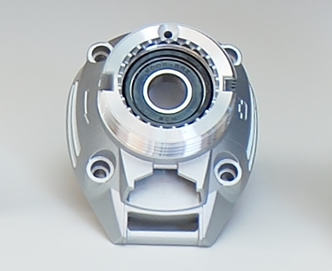 By adjusting the inside diameter with additional machining to accommodate the Tolerance Ring, the original intended (or alternate) ball bearing size can be installed. 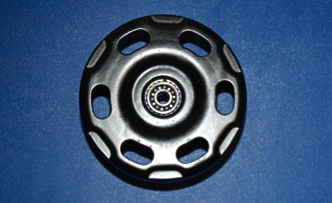 AN-style rings for popular ball bearing sizes are packaged individually and sold as TR packs in the aftermarket. 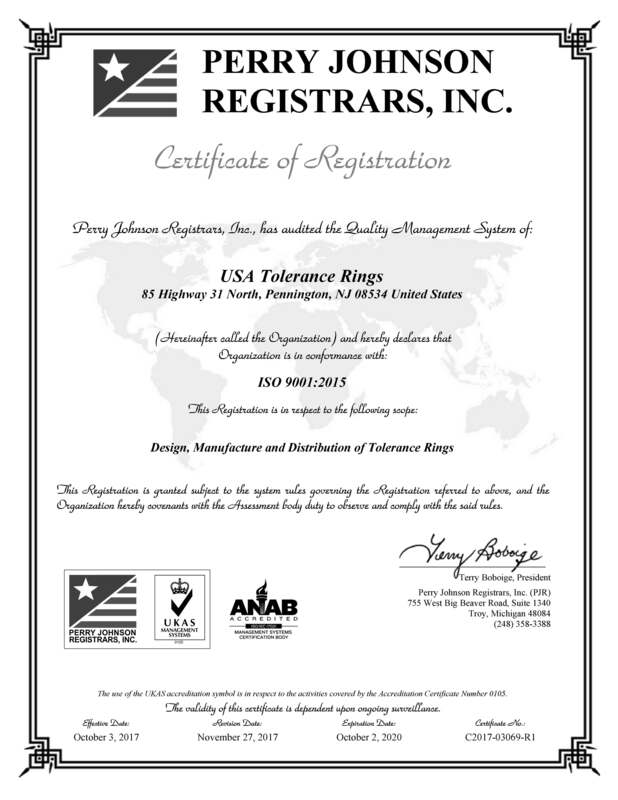 USA Tolerance Rings is proud to announce our new Xtreme Series product line.